The following is a series of plays I found interesting from the Week Three game against Kansas City. As we approach Week Four against the Chargers, what follows is what I hope will provide you, the reader, some cathartic relief from the drama of the past week surrounding Jimmy Garoppolo's injury. The following five plays are plays that I am purely looking at from a schematic standpoint and why I generally find so much of this scheme stuff so fun to write about and break down. Breaking down plays is a fun and exciting time for me during the season because I am always learning something from week to week as I watch more film and study more resources from old playbooks and reading the work of others who have devoted years and years to the science behind "football scheme." Yes, two of the plays in here were big plays the Chiefs had against the 49ers, but I point them out to show the brilliance and simplicity of the game behind the game, the ever constant battle of coaches on a chess board outmaneuvering their competition week to week with new wrinkles and old concepts.Take that for what it's worth. Kyle Shanahan is among the league's best play callers. Known for passing out of heavy personnel formations, he's built a career off big chunk plays from 21 and 22 personnel formations, and it is largely the result of having an efficient ground game. The 49ers currently have the league's leading rusher in Matt Breida who is averaging 91.3 yards per game, a league leading 8.6 yards per carry, and is Football Outsiders league leader in DVOA, nearly 30 points ahead of the #2, which measures efficiency on a per play basis. An efficient running game translates over into an effective play action phase of play. A staple of Shanahan's offense is the tight end "leak" concept or more commonly known as the throwback pass. Out of 21 personnel in a strong wing right formation, Garoppolo motions the fullback Kyle Juszczyk out to the left of the offensive line also in the wing position. Two games earlier against the Vikings, the 49ers ran this play to George Kittle and left Juszczyk in his traditional fullback position. Kittle dropped the pass. This time against the Chiefs, Shanahan boots Garoppolo out to the left off the outside zone run fake with the crossing route and deep out route breaking toward the left sideline. Juszczyk goes in the direction of the run action as the defense carries the quarterback and crossing route the opposite way. Juszczyk leaks out down the right sideline and Garoppolo turns and throws the pass out to him running away from the defense for the touchdown. Kyle Shanahan is known for being a West Coast Offense coach due to his upbringing and family history with the scheme. However, the best offensive minds in football have invented new ways to scheme receivers open and score points and that means they've had to borrow from other playbooks and schemes to succeed. Just within the last year, Shanahan has incorporated the Patriots "Erhardt Perkins" system as well as some spread and air raid concepts into his west coast offense. He also still runs old school WCO pass plays, albeit from a variety of looks. Not a purely WCO play concept, the above "mesh concept" has seen a resurgence in the NFL since 2013 when Chip Kelly, formerly of the Eagles and 49ers, used it as one of his primary pass plays. The play is a staple of the Air Raid offenses of Hal Mumme and Mike Leach. The mesh concept usually involves two receivers crossing underneath at a "mesh point" over the middle. The offense can add additional elements to further laterally or vertically stretch a defense. In this case Shanahan adds a shallow flat route, a deep dig or curl route over the middle, and a corner route. The concept is a triangle stretch that looks to corner, the crossing route, and the flat route. The 49ers are lined up with Breida out as a receiver in the trips bunch and Trent Taylor as the running back. The crossing routes confuse an already weak Chiefs secondary. Breida over the middle draws four defenders to him on his crossing route while the rest of the defense runs with the corner, the curl, and the flat route. Goodwin is all alone on the crossing route and Garoppolo spots him for an easy touchdown. The triple option is one of football's oldest offensive schemes, with now basically only four teams employing it in a full time capacity (Navy, Army, Air Force, Georgia Tech). It's the preferred offense of choice in particular for the service academies due to the nature of the recruits the schools get. They generally get smaller players who could not line up in a regular offense and go toe to toe with the best schools so they have to resort to a kind of asymmetrical warfare to compete. In the NFL, no one runs a triple option offense because defenses are faster than your average college defense (duh), and no one wants to get his franchise quarterback hurt by running the same veer, dive, and speed options all game long. In fact, teams have only used the zone read in the NFL sparingly since its incorporation at the pro level in 2012. But the best football minds are always coming up with ways to incorporate new wrinkles and if a coach wants to run a variation of the option, he can always find ways to dress it up. 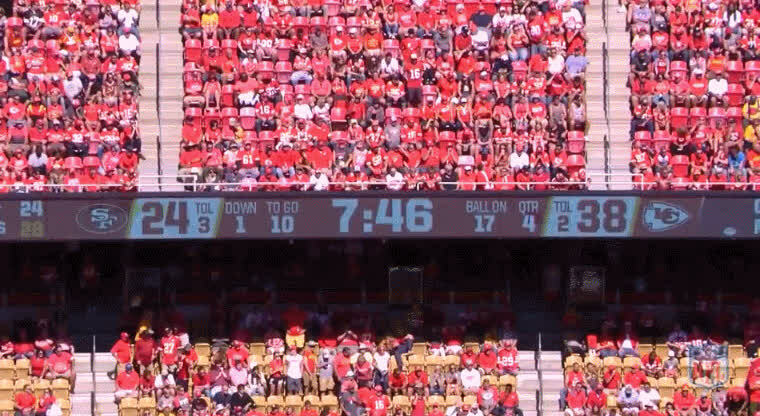 The Chiefs ran a simple speed option that picked up a first down in this game with quarterback Patrick Mahomes (though he took a big hit in the process). Wanting to add new wrinkles to his playbook, Shanahan also drew up a fullback speed option that had Juszczyk taking the handoff from Garoppolo and optioning out with Breida. In the speed option, the pitch man will usually read an edge defender who is unblocked or a 2nd level linebacker or safety who is tasked with setting the edge. The read is simple, if the unblocked defender plays the pitch man, he'll pitch it out to the "slotback" or "B" back. If the defender plays the slotback or B-back, the pitch man will keep the ball and turn up field. In this case, the Chiefs edge defender plays the pitch man (Juszczyk) so he pitches it out to Breida who turns up field and gains 13 yards before going out of bounds at the four yard line. In league that has evolved seemingly every decade for the last 100 years, or even year to year, there comes a point when you can only scheme so many different route combinations against a variety of defenses. Therefore it only seems natural that teams copy each other in the present. If a play works for one team, you can guarantee you'll see it in the weeks and months that follow, like the Philly special Brown's quarterback Baker Mayfield caught for a two-point conversion last Thursday, the play made famous in the last Super Bowl. Another play teams are running from week to week that was made famous by Kyle Shanahan, and one the 49ers run varying degrees of with relative success, is the "Yankee" concept. The "Yankee" concept is a two-wide receiver deep-crossing combo, with the underneath receiver running a deep over-the-middle route, and the other executing a deep post over the top. There's usually a shallow flat route as a check-down also. 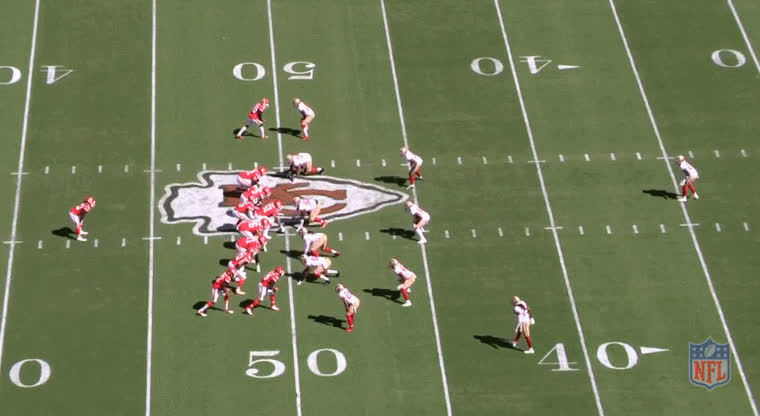 The Chiefs line up in a trips-two-man-stack formation to the right with Tyreek Hill running the deep post from the opposite side of the formation. The pass blocking is usually max protect due to the time it takes for the routes to develop. The 49ers cover it pretty well. Sherman gains depth and drifts under the post route away from the crosser as it's covered. But Hill's move toward the corner before breaking to the post turns safety Adrian Colbert around, giving Hill the needed space to run under the catch for a 42 yard gain. For some reason the 49ers love to run cover three inside the red zone. 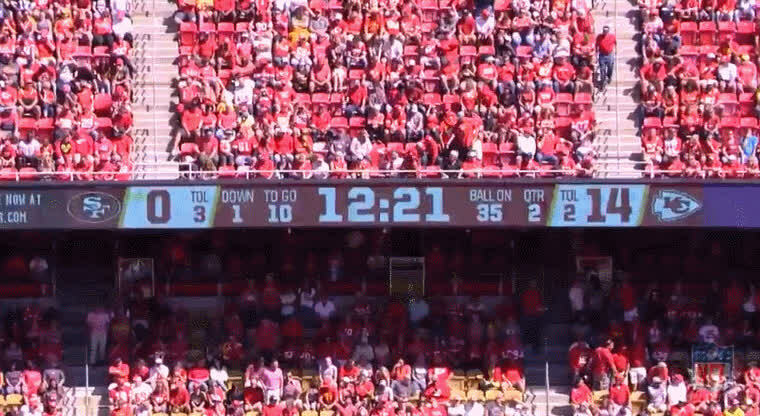 Chiefs head coach Andy Reid knows this and schemed up a play out of a formation they typically run with their quick passing game utilizing the "stick" concept, according to The Athletic's Ted Nguyen. The stick is usually an inside route run to around five yards before the receiver plants and "sticks" his foot in the ground and turns around. The route is designed for the quarterback to get the ball out quick, minimizing the time the offensive line has to pass block. 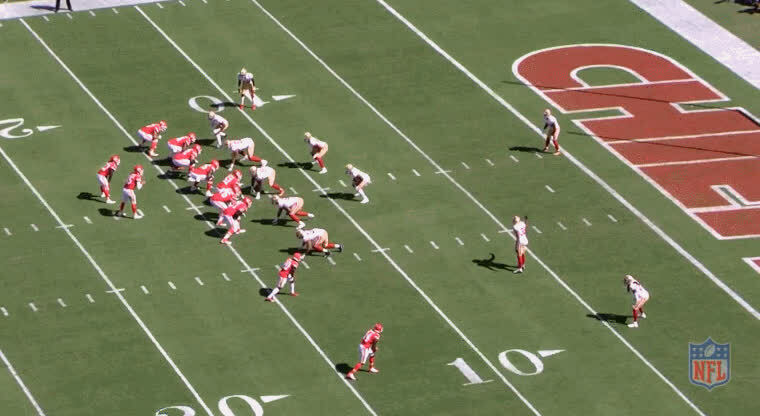 Only this time, with the 49ers in cover three inside the 15 yard line, Reid calls up the "double stick nod." On a stick nod, the receiver running the stick route will plant and give an out cut fake before pivoting back inside and up the seam. The play is ideal against cover three because the free safety can't cover two vertical routes run at his zone. Mahomes looks off safety Tarvarius Moore, getting him to bite on the stick nod by Hill from the right slot position. 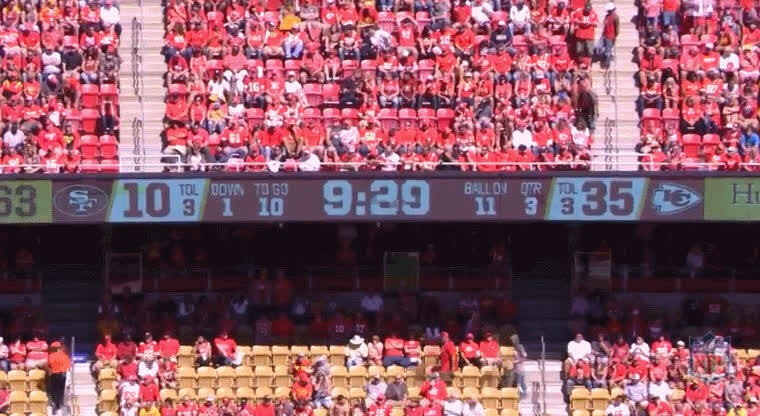 Mahomes quickly comes off Hill's route and turns toward the opposite side and fires an almost no-look pass to receiver Demetrius Harris for a touchdown. Aside from the outcome of the game this past Sunday, I hope this gives you a little more insight into concepts and schemes not only the 49ers use but other teams use as well. Look for this to be an almost regular feature this season as I find plays and concepts that look interesting. All pics and images courtesy of the NFL. All statistics courtesy of Pro Football Reference.